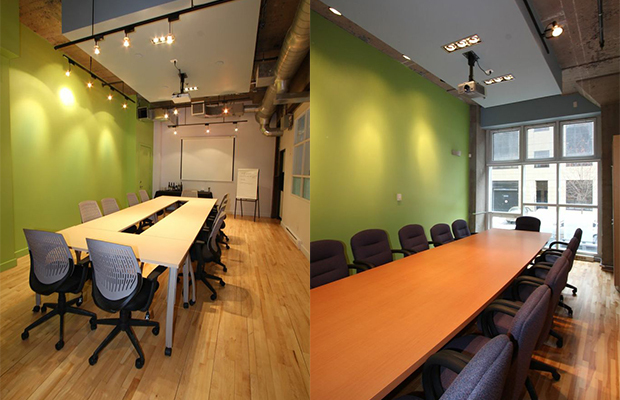 Are you looking for a location to hold meetings in Montreal? We have set up an office at just a stone’s throw from the downtown core for members passing through Old Montréal. In addition to the usual services (furniture, audiovisual equipment, and reception desk), users have robust technological infrastructures at their fingertips. Our business centre is the ideal venue for all your Montréal meetings. Closed office with a work table, president’s chair, and two visitor chairs. High ceilings. IP phone. Internet access. Furniture and shelf space. Why not hold your meetings in a work environment conducive to discussion? The AQT has two newly renovated and air conditioned industrial-style meeting rooms ready for you in the heart of the Cité du Multimédia. Contact Chantal Pesant at 514 874-2667 ext. 117. Please note that this service is for AQT's members only. One street west of McGill between De la Commune and Wellington streets.